He had a lot to say about the Belmont Park lease that the City Council just rejected on Monday. He knew that we’d been covering the issue. Today, the U-T ran an article on the rejection, tacking in favor of the current managers, it seemed. Harris wanted to set the record straight. Harris, you see, led a Council majority yesterday in rejecting the proposed new lease for Pacifica Enterprises because the cut the City is getting is not fair. All the Democrats followed his lead (Emerald was out) and are having the issue return to the Council in 60 days. The Republicans all voted to renew the current lease. Agreed Seth! This guy has brains and balls! Our up and coming council person Ms. Zapf loved the deal???? And Pacifica wanted to bring in Valet Parking!!!! It will be sad to Mr. Harris to represent the beaches. Maybe a recall will be fitting for Zapf if she continues this behavior? Anyhow, I am going to watch the council meeting on tape and just see what was said by who to who. Mr. Harris you did good today! Way to go, Councilman Harris !!!!!! Hope you can also increase the parking and make it FREE !!!!!!! Sans Zapf. What a scoundrel she continues to be . for the DEMOCRAT CAROL KIM !!!! This is EXTREMELY IMPORTANT !!! Two years ago there was rampant drug use and alcohol abuse at the park at their Sunday rave parties. Now you can jog the boardwalk without side stepping the vomit in the morning. The local police love the new operators since there call for service are down 90% and they can dedicate time to the rest of us on the weekends. According to the UT these guys have already put in 25 million and rents are up 50%. Where is the bad news here? Does anyone on the council understand basic investment strategy? I thought not. Interesting comment. The implication is that the former operators were lousy because of drug and alcohol abuse at the park and the new guys have cleaned it all up? And the “local police,” assuming you mean the SDPD loves the new operators? Where do you get all this information? Service calls down 90%? What does any of this have to do with requiring the operators to pay a more realistic lease for the property? It has nothing to do with it. His post made no sense at all. Apparently basic investment strategy is to get the city government to subsidize your costs due to an obsolete agreement from the 80s. … and don’t forget, Zapf voted for the current lease – another bonus to a big business. hiya doin? Thank you Councilmember Ed Harris! Rob the Poor Feed the Rich, that’s the theme of our next meeting at the Point Loma Assembly this Sunday at 4pm. Everyone’s invited to learn more about the culture that allows the transfer of public assets to private groups. Cory Briggs will be talking about TOT and TMD, and Linda Perine will discuss Who Runs San Diego? and why the so-called Taxpayers Association is not looking out for us. It was interesting to watch this meeting to listen to who said what, how they said it and what the meant when they said it. Watch it for yourself. No matter who takes over the lease, the city is on the hook to pay for the repairs to the Plunge. Prior lessees were responsible for maintenance but that didn’t always happen and the city did little to enforce the terms of the lease and now the Plunge is a mess! If Pacifica does the repairs they get a rent credit. If Pacific does not do the repairs, the city can hire a contractor to get the work done and issue a bond for the repairs. The bond premiums can be paid from the rental income which the lessee will no longer be entitled to receive. Yes, Pacifica has done many improvements of the property but they let the athletic club close and allowed the Plunge to further deteriorate. Why should the city believe they won’t continue this practice? Another issue….seismic retro fit standards need to be met. How does that affect repairs and opening of the plunge? There are 23 years left on the existing lease and Pacifica wants it extended to 50 years. The lease is NOT favorable to the city and as one intelligent speaker mentioned, the lease is too cheap and a 50 year lease is more sell-able than usable. Assignment of the lease does not require city council approval. So Pacifica is free to sell the lease at anytime to anyone as the current lease is written. Councilman Sherman insinuated because Councilman Harris was appointed he had no business “to jack this up”. I guess if you are appointed you are suppose sit in council meeting like a bump on a log??? Council President mentioned a few times that everyone should be respectful of Councilman Harris and that he DOES represent his district. Councilwoman Zapf who at times does not finish a sentence or thought, throws her hands up repeatedly saying; “it’s a good deal for the taxpayer” and “it’s a fantastic deal”. It was important to Zapf to get the deal done, extend the lease and make sure Pacifica wraps up their deal to acquire the roller coaster also. Other similar municipal leases such as Santa Monica pier have higher rent % and shorter terms. Me thinks…the city should put the contract out to bid. 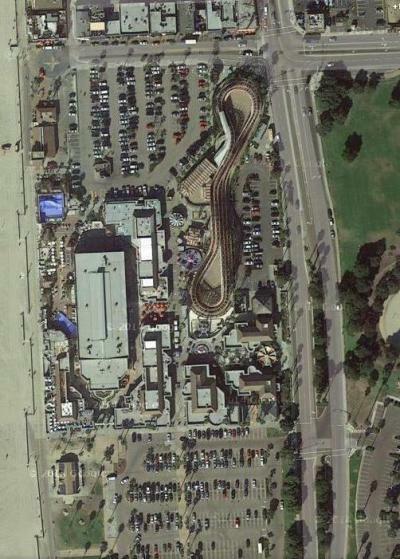 Ask the lessee of the Santa Monica Pier if they are interested along with other successful municiple lessees and let’s make sure that the San Diego Taxpayer is getting the best deal…..don’t make this another Corky McMillin deal. I want editordude to post this as a “Reader Rant” okay? BRAVO to U San Diego Councilman Ed HARRIS. . .
Seemingly in print the “PATHETIC” article reads to at least U being more than awake; U have smarts & wits about U. And the devil, U know, the devil deep in lease terms re any income to the City of SD & the details stuff, how much is it to be, much more where is it, how is it to be generated & when? So was it in the present or modified lease details that Council persons SHERMAN & ZAPH have blessed? How about the CPA audited & certified investment proforma presumably presented way back to the CITY by the present Lessee re their “money-making lease,” this for the City of SD re the Belmont Park land? Seemingly by ways of veiled threats, is this extension request from PACIFICA ENTERPRISES, (a tony Rancho Santa Fe outfit whose company officers & staff last names read, (Luca, Corleoni) to belong in a GODFATHER film), are they for real, this whoever are the real Pacifica Chieftains are to now begin their political arm twisting? Whose political arms & necks will be next, this if not blessing it, (the lease extension) and the Pacifica proforma swallowed by some of the City Council, it was more than Mexican beer, right? Does it not seem to be the time to raise a red flag & ask for a public inquisition of these USD Catholic trained real estate mafioso’s, ones who are setting up what, a legitimate flip & switch enterprise on City of San Diego land @ Belmont Park, where the citizens of San Diego more than likely will soon be taking the hits? Jump back SD Council persons, this to you all creating a real world development deal, one which will have “PROVEN” track record AAA to AA tenants. Hire an experienced real bay-beach-side developer, (like ones in Newport Beach.) It’s not too late to either rescind it or buy out PACIFICA, who appear to be nothing more than commercial lease flip artists & they will do so after they’ve extracted every $$$ from the proposed tenants & of course the City of SD. Of all the commercial real estate deals, be they existing or to be developments on City of San Diego land, this the ground leases the SD Council has green lighted in the past, how many times does it take for U all to realize, the City of SD is getting screwed. . .again? In essence the City Council is passing the next development-flip & switch screw-job onto the citizens of SD, this by looting their pocketbooks & depriving specifically Mission Beach owners/residents of recreational eat, meet & speak locations for peace of minds! Did this extension-modification to the Belmont Park lease pass the sniff-test by the illusory City Attorney, Mister Goldsmith? And if so, he must have had a case of pneumonia when he gave the City Council the green light to do it, as it smells from where I am, this 100 miles away, this to be a public soaking, and not in parking lot puddles, but perhaps someone in office swimming offshore with the fishes, this if the lease extension request is not granted to Pacifica! Sleep well, Mission Beach residential & commercial owners, residents & tenants. For is this not, this Pacifica beach sandlot show to become another sad joke on all, plus the City of San Diego & of course in time certain City Councilpersons who are being used/had/paid off under the tables again? Guess! Strip them down Ed, then nail their back stabbing naked arses to the Mission beach boardwalk front walls, this so all decent & respectable Mission Beach owners & SD residents, (yes, there are many who still live there), this to open their eyes to see who these crooks really are, politicians included. This in calling out their hollow-talk matching their false bravado walk, ones who will say & do anything to make a buck & almost always at the expense of SD Citizens. This when it comes to their “promoting” a commercial development deal on City of SD land, just like this Belmont Park lease matter, one which pretty much like the last lessee will float out to sea & without a surfboard, dinghy or on a raft. Buenas Suerte & Salud. . . .
City Beat is on this issue also. Does anyone know how the lawsuit was settled and exactly what role Pacifica played in the settlement for which they gave themselves a pat on the back”. Is Lochtefeld now employed by Pacifica???? ” Tom Lochtefeld, who last year settled a $25-million lawsuit over his bankruptcy that he contended occurred due to the city’s refusal to consider his plan for a hotel. If anyone is interested…..Brett Miller along is getting Ms. Zapf’s support for the Belmont Park give away…..